Researchers have re-created Supermans Memory Crystals – storage devices that can last billions of years. Researchers at the University of Southampton have made a major step forward in the development of digital data storage by creating a glass disc that can store massive amounts of data for 13.8 billions of years. Dubbed the ‘Superman memory crystal’ because of the comparisons between it and the memory crystals that Superman used in the 1970’s films the data is encoded in five dimensions – size and orientation are the first two dimensions and the other three dimensions come courtesy of the position of these nanostructures and fused in quartz as an non editable, permanent record. Using nanostructured glass, scientists from the University’s Optoelectronics Research Centre (ORC) developed the recording and retrieval of “Five Dimensional” (5D) digital data using a femtosecond laser – an ultrafast laser that uses incredibly short pulses of laser light that each just last just a femtosecond (one quadrillionth of a second) and each data file is written in three layers using nanostructured dots that are separated by just five micrometres (one millionth of a metre). These small nanostructures change the way that light travels through glass, modifying its polarisation so that the data can then be read using the combination of an optical microscope and a polariser – similar to the technology in your polarising sunglasses. The new storage technology has some amazing characteristics that include being able to store 360 TB on each small disc, the ability to withstand temperatures of up to 1,000°C and the ability to store information for an almost unlimited amount of time when stored at room temperature, opening a new era of eternal data archiving that could be very useful in todays – and tomorrows – data obsessed society. The technology was first experimentally demonstrated in 2013 when a 300 kb digital copy of a text file was successfully recorded in 5D. 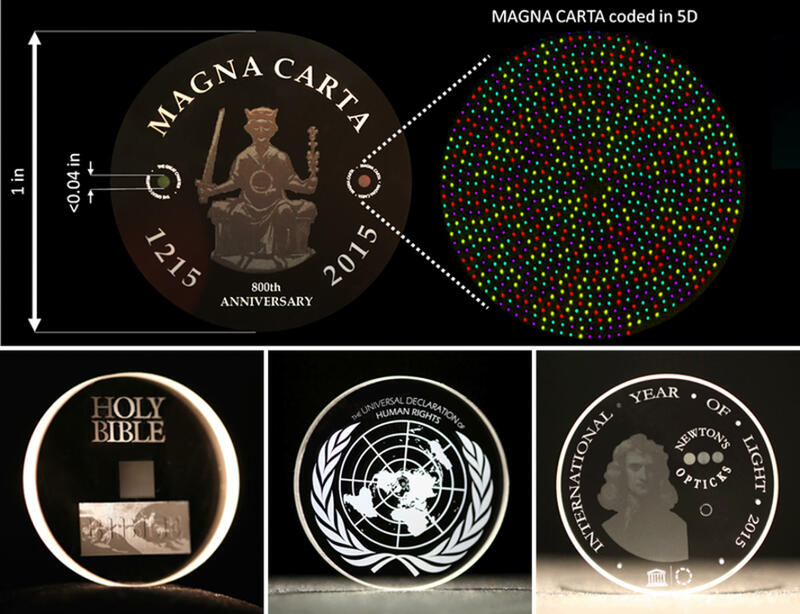 Now, major documents from human history such as Universal Declaration of Human Rights (UDHR), Newton’s Opticks, Magna Carta and Kings James Bible, have been saved as digital copies that could, ultimately, survive the human race. A copy of the UDHR encoded to 5D data storage was recently presented to UNESCO by the ORC at the International Year of Light (IYL) closing ceremony in Mexico. “It is thrilling to think that we have created the technology to preserve documents and information and store it in space for future generations. This technology can secure the last evidence of our civilisation: all we’ve learnt will not be forgotten,” said Professor Peter Kazansky, from the ORC. The researchers will present their research at the photonics industry’s renowned SPIE – The International Society for Optical Engineering Conference in San Francisco, USA next week and now the team are looking for industry partners to help them further develop and commercialise this ground breaking new technology.